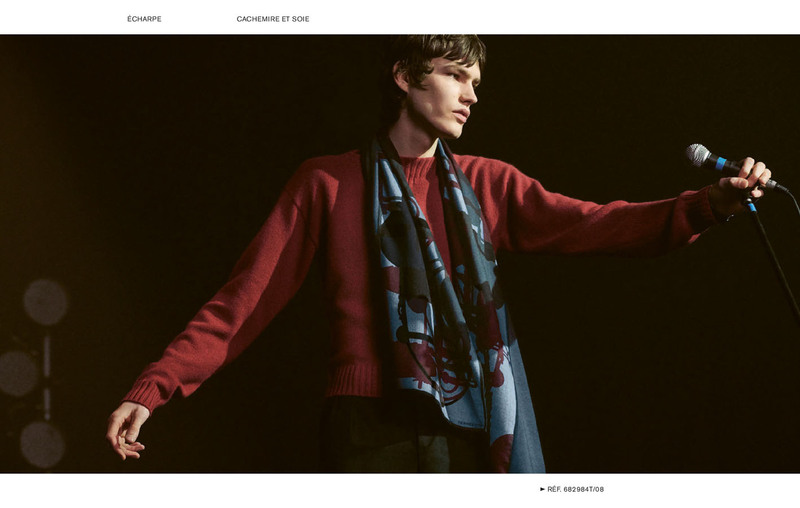 Go to Paris and visit La Maison Hermès located at 24 Rue du Faubourg Saint-Honoré, now presenting the fascinated Hermès Cravates Fall/Winter 2018 Campaign and all the scars and ties you can find there. To build this fabulous campaign, we have the work of photographer Mark Peckmezian–responsible to do Tyler, The Creator cover for Fantastic Man and new Robyn single “I Miss U”. Also collaborating as stylist Mattias Karlsson and grooming Sebastien Richard. Models squad are Elias Poot, Alpha Dia, Augustin Basso and Joseph Signoret. Neckties have a common place among men around the globe, yet they serve no practical purpose and are merely decorative. What became known as “the tie” approximately three hundred years ago has been in existence for thousands of years, dating as far back as the dawn of human existence. Fashion experts, sociologists and other professionals have been contemplating the tie for years and how it has somehow become the pinnacle of business attire. While many men dread the thought of having to tie the knot, others relish in the fact that they’re carrying on a proud tradition of formality, poise, and elegance. To chart the tie’s appearance and determine its significance, we’ll go back in time to the antiquities when man first sculpted or painted early neckties prominently wrapped around their nape. Of course, this is only a brief overview of the history as entire books have been dedicated to the subject of the evolution of neckwear. If we go back four thousand years to ancient Egypt, we can examine the necks of many Pharoahs and notice broad ties adorned with precious stones wrapped around their necks. Archeologists have found what is believed to be a talisman known as the Knot of Isis around the necks of mummies. It is called that way because it resembles a knot used to secure the garments worn by Egyptian gods and is much older than the terrorist organization that is associated with the world “Isis” today. Even some Indios of certain tribes in the Amazon and Aborigines in Oceania wear very little clothing but neckwear. While it’s impossible to establish the specific time that modern man began to wrap knotted fabric around his neck, it is evident that neckwear has a tradition on a global scale and not just in the Americas and Europe. In the wake of the upheavals of the Thirty Years War, Europe introduced the necktie as we know it today. While the tie’s predecessor, the scarf, was notably present before the war, it is still difficult to build a timeline and determine the exact history and progression of the necktie. The cravat he wore was made of lace imported from either Flanders or Venice, and it became the responsibility of the staff member assigned to the kind’s toilette and wardrobe to procure them. This role was highly coveted, and the individual fortunate enough to be tasked with it was given the extraordinary title of “Cravatier”. His duties included laying a tray out for the king with cravats for his choosing, each decorated and adorned with colorful ribbons. While the Cravatier was responsible for the selection, the king took great pride in tying the know himself, while the Cravatier observed and added the final touches, ensuring it was straight and well tied for someone of the king’s royal magnitude. What little we know is that scarves were documented to be in use on two occasions historically in different civilizations. Interestingly enough, apart from simply knowing the dates, there is no knowledge of scarves being used in earlier or later periods at all. In the end, the tie is decorative and an element that is supposed to flatter its wearer. From “bad tie parties” to “black tie events”, ties are an important part of a gentleman’s wardrobe because they possess a big impact on how one is perceived, and it servers to complete one’s outfit. Psychologically, you can find many reasons to wear a tie, though the best one is to express yourself.